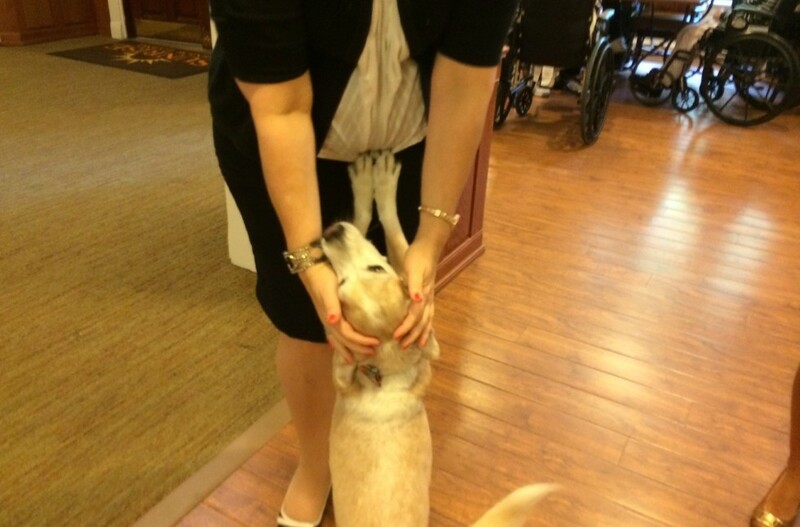 On a recent Thursday afternoon, human residents of a Sunrise Senior Living home in Washington, D.C. enjoyed white wine and crabcakes, while Bugsy the beagle nosed around the dining room for crumbs before heading outside for a quick romp in the garden. Bugsy is a former shelter dog, now in the company of a whole bunch of retirees. And he's not alone, since on top of the 115-odd people who live at his facility in a quiet part of the nation's capital, he's got a formerly-homeless, three-legged cat buddy named Nesbitt to keep him and the humans company, too. It's one of a number of places where retired people and shelter pets are living our their golden years together, including hundreds of other Sunrise locations. "Nesbitt has a calming effect on the residents," says the home's executive director Beth Jansen, who is also Bugsy's adoptive mom. "Makes it feel homey." Bugsy is the rescue dog for Sunrise's Washington, D.C. facility. He likes to graze for food in the dining room and romp outside in the gardens. He's here with Beth Jansen, his adoptive mom and the facility's executive director. There are said to be some major health benefits to keeping pets: studies show that pet owners have better cardiovascular health, exercise more, have more friends and just plain feel better. And given that Americans are so pet-crazy that we're expected to spend more than $58 billion on our animals in 2014, it's perhaps not a surprise that people are attached to these little guys, and increasingly unwilling to give up life with animals. Because research has shown some seniors benefit from regular contact with animals, such privileges are expanding to assisted living and nursing units where elders have mild to serious medical conditions. But there is another reason, too: It's good for business. Allowing pets is an amenity consumers want, like transportation and flexible meal plans. Since Sunrise Senior Living started in the early 1980s, it's encouraged those who are capable of caring for their pets to move in their animals, too. Which they've done, bringing in a lot of cats and dogs, and "the occasional bird," says Jansen. But for those who haven't brought their own, each of Sunrise's 300-odd locations have at least two in-house, communal furry friends -- usually a cat, who in most of the homes spends the bulk of time with folks with memory loss, and a dog, who hangs out everywhere there's food and/or a nice spot for a nap. The majority of these animals have come from shelters. 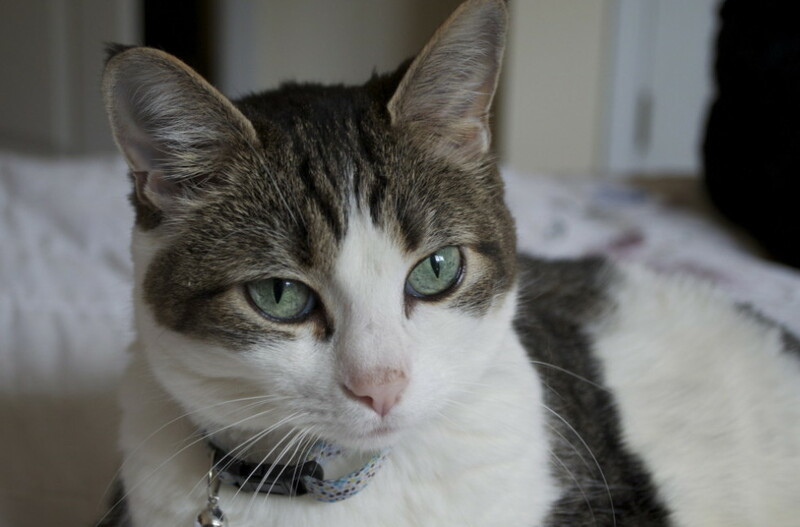 Mrs. Beasley is a formerly homeless cat who lives in Sunrise's Cuyahoga, Ohio, home. That's great for the animals. And, says Sunrise's director of program services Samantha Lawrence, bringing in shelter pets is really good for the people, too. Call it a new leash on life for everyone. "Many residents struggle with the transition to assisted living, as they have had to give up their homes and do not feel as independent as they once were," she says. "Welcoming a rescue animal into our community allows them to feel that they are giving a pet what Sunrise is giving them -- a second chance at an independent and joyful life, just in a new place." As for Bugsy, he's come bounding back inside from the garden, and has resumed vacuuming his way around the dining room. He may be a rescue, and he may be a comfort as well as a symbol of redemption, reprieve -- but he is also, at the center of it, a dog. Do you know someone doing right by shelter pets? Do you have another animal story to share? Get in touch at arin.greenwood@huffingtonpost.com! These Long-Term Shelter Residents Need Homes! Spunky, sassy Ilea always has a smile on her face! She's a fun lass that adores playing in the yard and going on long walks. Ilea knows basic commands and since she's very eager to please (just look at that face! ), she'd make a great student for future training. What Ilea needs is a savvy big-dog owner willing to invest some time and energy into helping her become the best dog she can be. If you're up to the task, you'll be rewarded with a best friend for life! Find out more from <a href="http://bestfriends.org/" target="_blank">Best Friends Animal Society</a>.